It started with an opportune question. Do you use organic cotton? a well-dressed man asked one Saturday earlier this year at the Northampton Winter Farmers’ Market. And there’s a longer answer because I’ve thought about this question off and on over the years. I know there are environmental concerns about the toxic agrichemicals used to grow cotton as well as the amount of water and energy used to grow and process the fiber. When the man asked about organic cotton, I’d been reading and thinking about sustainability and decided to take a leap and explore my options. A Google search confirmed my suspicion that, while the organic cotton market is growing, there’s still very little available for the handweaver. Of the possibilities, I was most interested in the naturally-colored cotton because the color resides in the cotton itself; it’s not dyed. Sally Fox has been breeding and growing organic cotton in California and Arizona since 1982. 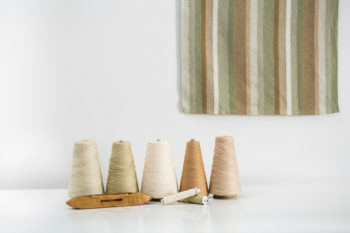 She’s developed varieties of cotton whose lint grows in shades of brown and green and has fibers long enough to be machine spun making it loom-ready. When I first heard about Sally Fox ten years ago, I ordered her sample cards. 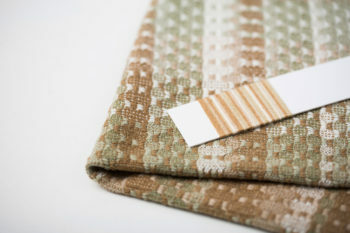 A relatively new weaver at that time, I wasn’t ready to work with a limited color palette of whites, browns and greens. In my recent Google search I was excited to also find naturally-colored cotton that’s sustainably grown in California and New Mexico. While it’s not organic, it has been grown without the 13 most toxic chemicals. Plus it’s grown and spun in the United States, so there’s a smaller carbon footprint than cotton grown overseas and shipped to the United States. I decided to try this cotton for a few reasons. 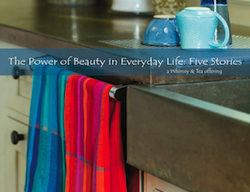 It’s available in the weight with which I weave my other towels so I wouldn’t need to rework my designs. I was more comfortable with the price point. I also felt a connection with this cotton, having met a couple farmers from the Sustainable Cotton Project about five years ago. 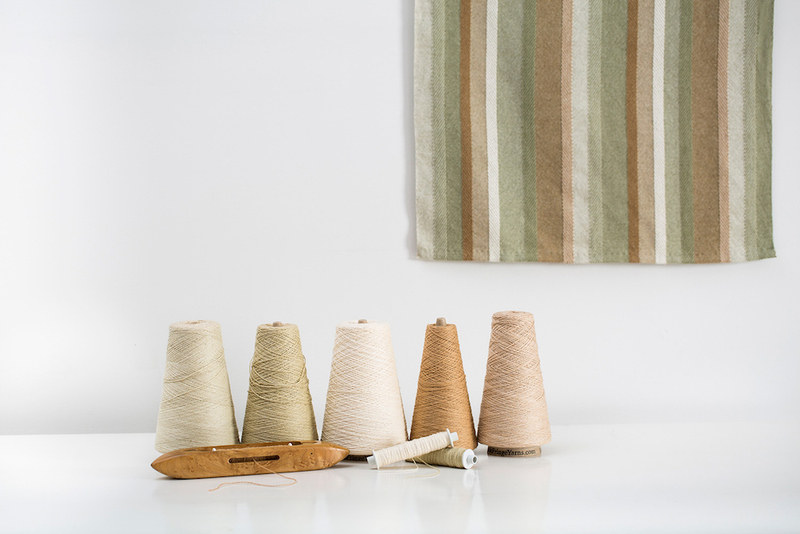 I ordered a small cone of each of the five colors — natural, dark and light brown, dark and light green – and wove a gamp, a sample to try out different weave structures and design ideas. I was especially curious to see how the colors worked together. Exploring color has been an important part of my weaving journey and the subtle colors of these natural cottons provide new learning opportunities. In addition to the limited palette, this naturally-colored cotton has provided another color challenge: the colors, especially the greens, change in the wash. On the cones, the greens don’t look very green and it’s hard to tell the dark and light apart. However, once I washed the woven fabric with washing soda (sodium carbonate) on the hot cycle, their tones developed into a rich sage and olive greens. I spoke with Katzy at Lunatic Fringe, the company from which I bought the cotton. She explained that minerals in one’s water affect the pH and hence the color. The green isn’t as stable a color as the brown. In her experience, the greens turn browner when her towels hang in the kitchen sunlight, but then return to green when she washes them. Since the color is in the plant itself, not in dyes, these cones are marked with the year the cotton was grown. The greens and browns may vary from year to year. I like to think that, like wine grapes, the cotton may express terroir – that it’s affected by the soil and growing conditions, and then further affected by the water in which it’s washed. The gamp I wove gave me enough information to feel comfortable moving ahead, so I ordered more cotton and started weaving towels. I used one of the first towels right away and was disappointed that it wasn’t as absorbent as my others. Friends to whom I’d sent towels for feedback also noticed a lack of absorbency, so I put the project on hold while I figured out what to do. My friends Lisa and Melissa explained that cotton has a waxiness to it. On their recommendation, I boiled the towels in a canning pot on the stove. Two hours and one smelly kitchen later, I was thrilled to find the towel was as absorbent as I’d hoped. I passed the information along to my friends who kindly agreed to boil their test towels. With success on their end confirmed, boiling is now part of my production process. I’m excited to add this sustainably-grown cotton to my offerings because the more I weave with this cotton, the more I like it. 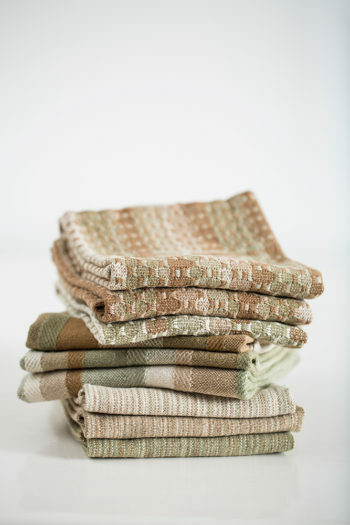 Plus I want to support sustainable growing practices as well as the few spinning mills left in the United States. I’ve started with three designs and have a total of 25 towels and 4 pairs of napkins for sale. I’m introducing these at the same prices as my other towels and napkins. If I continue working with this sustainably-grown cotton, the price will undoubtedly go up as it’s more expensive and adds additional labor to my production. The bonus is that I’ve gained an appreciation for the complexity of sustainability. Fiber is only one part of the equation, albeit an important one. Energy and water are used throughout the cotton’s journey from seed to well-used towel – to grow, spin or transport the fiber, to weave or wash the cloth. I’m sure there will be other factors to consider as I continue exploring sustainability. I’m curious to see what response I get to this cotton. I’d love to know whether sustainably-grown or organic cotton interests you, whether or not you decide to buy some of these first towels and napkins. I invite you to share your thoughts, questions or concerns.